Illstreet offers, in addition to the carbon dial table, to reduced operating inertia still further, lightweight composite tooling. Illstreet can design composite tooling using either continuous carbon and glass fiber or from polyurethane moldings. 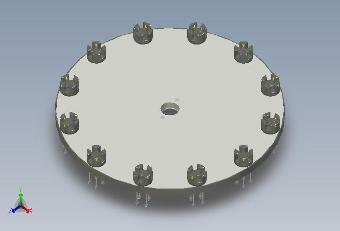 Shown is a polyurethane tooling nest for a cosmetic dish. Lightweight composite tooling is designed by Illstreet engineering to clients requirements. 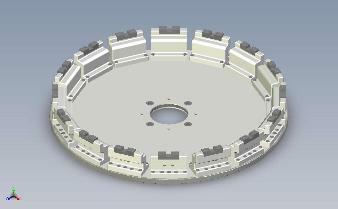 Illstreet engineering offers the service of assembling the tooling to the carbon dial table and testing functionality. 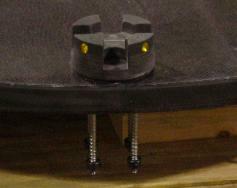 An example of lightweight composite tooling nests mounted on a 42" Diameter Carbon Dial Table, 12 stations. 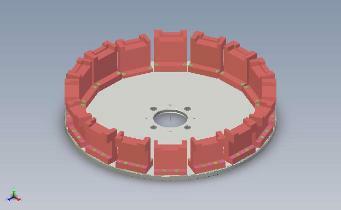 30 inch Diameter Carbon Dial Table designs with 16 composite laminate tooling stations. 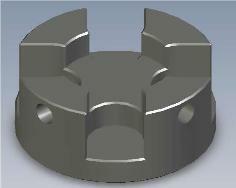 Designs show tooling attachment and steel insert for part location. 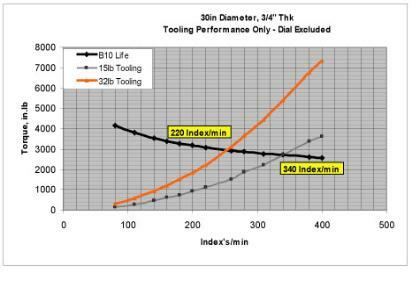 Comparative performance of 32lb tooling with 15 lb tooling. The number of possible index's for 32 lbs tooling is 220 while the number of index's by reducing the tooling weight by 50% was 340. Comparative index/min performance of a special 30 inch diameter carbon dial table, 0.75 thick, showing effect of tool weight reduction from 80 lbs to 32 lbs. The special 30 inch carbon dial table showed an increase in index/min performance from 155 index's/min to 233 index's/min by reducing tool weight from 80 lbs to 32 lbs. 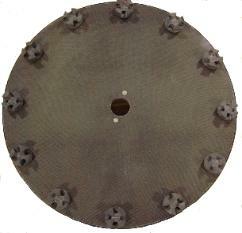 Comparative index/min performance of a 30 inch diameter aluminum dial table, 0.75 thick, showing effect of tool weight reduction from 80 lbs to 32 lbs. A aluminum 30 inch diameter dial table also had a performance increase from 139 index's/min to 175 index's/min by reducing the tooling weight from 80 lbs to 32 lbs.